After spending the whole week with a yucky summer stomach bug, Catheryn was finally feeling good enough today to get out of the house. We decided to ride our bikes down to the Farmers Market. Perhaps it was a little much for her, since she had not eaten since Monday, but she forgot all about her weakness once she saw the ponies. Every time we have visited the market, she has wanted to ride the ponies. Actually, she has wanted to ride just about every pony she has ever seen. I can’t blame her there, I usually want to ride them, too. But today she just happened to have $3 in her purse, the exact amount needed for three laps on the back of a pony. She was one happy girl, and it sure was good to see her smile again. 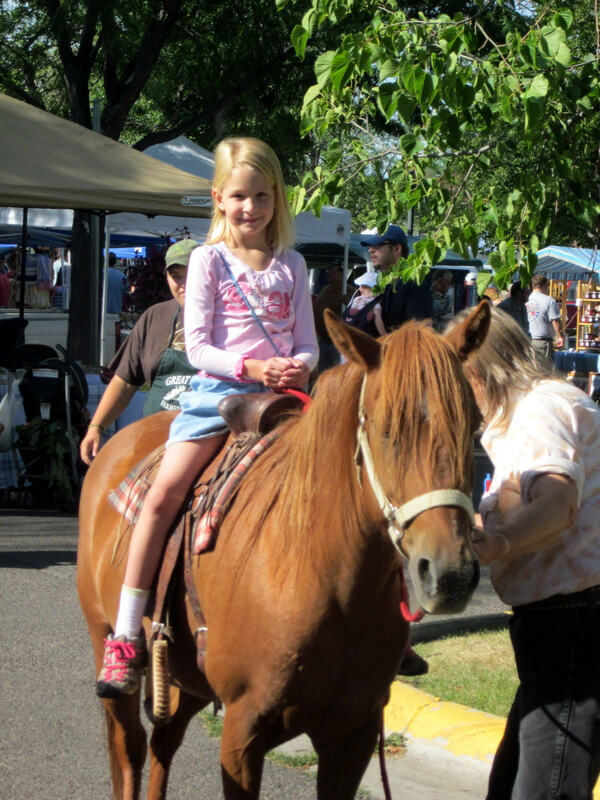 This entry was posted in Crazy Kids, Daily Life, Family Adventures and tagged farmers market, pony rides, postaday2011. Bookmark the permalink. She got her heart’s desire – lovely photo of her. It was enough to take her mind off everything else for a little while. 🙂 She needed that. Your Catherine looks about the same age as my grand-daughter Grace, maybe a little younger..but Grace has been potty about horses, ponies, mules, donkeys and any other horse related animal since she was very small. Now she even walks like a horse which is getting very worrying. Maybe she will grow out of it. She comes from a family of horsey people. Catherine looked so happy that at last she achieved what she had wanted to do…one contented little girl..at least for the time being! I’m really glad Catey and Will are feeling better. What a strange summer bug! It was quite bizarre. Hopefully we are completely done with it.